Concrete slab floors are available in different shapes and useful for delivering great thermal comfort and lifestyle benefits. Slabs range from on-ground, suspended, or a mix of both. They are insulated, both below and on the edges. Traditional concrete contains greater embodied energy. It is the most recognized material utilized in slabs but there are various new materials which can significantly minimize the environmental impact. The following types of concrete slabs are ideal for a specific site and climate zone as compared to others. Slab-on-ground: Slab-on-ground is normally used and it contains two variants: traditional slabs with deep excavated beams and waffle pod slabs, which rest near ground level and contain a grid of expanded polystyrene foam pods like void formers producing a maze of beams in between. Traditional slabs are insulated underneath the broad floor panels; waffle pods are insulated underneath. Both are benefited from slab edge insulation. The slab on the ground is built up like the stiffened raft, however, there is no need to use internal stiffening beams and it can only be developed on Class A or Class S sites. Suspended slab: Suspended slabs stand for above-ground level slabs. 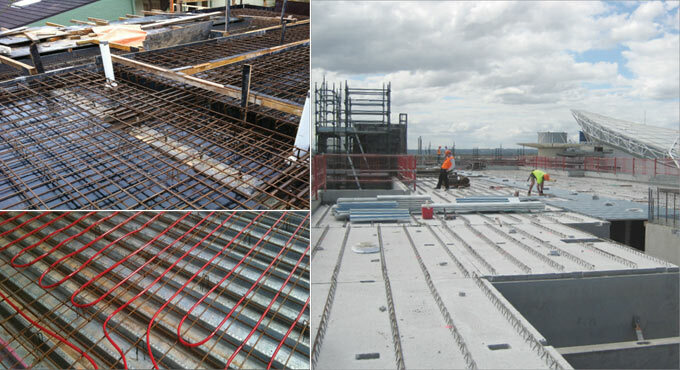 Suspended slabs are constructed and poured in situ, with either detachable or ‘lost’ non-loadbearing formwork, or permanent formwork which builds up portion of the reinforcement. These types of slabs are not directly in touch with the earth. They are generally utilized to build up floors for the upper basements of houses, but can also be rest on top of pre-constructed walls to develop a ground floor. Precast slab: Precast slabs are fabricated off site and delivered to the site through crane, either in finished form or with an extra thin pour of concrete over the top. They are constructed with traditional or post-tensioned reinforced concrete, or autoclaved aerated concrete (AAC).